Both were cracking pubs, with a lively buzz about them – though evidently more so at Gallagher's; largely due to a line of customer's awaiting their hair cuts, and a gathering of servicemen in the bar – drinking the place dry. At The Stork we had to do with the barmaid, a lone lobby drinker, and Columbo on the public bar TV. It still had bags of atmosphere all the same, and a most wonderful place – especially if you like decorative tiling. I personally didn't grab a cut and blow at Gallagher's, but I did manage to come away with half a dozen Courage glasses from The Stork – three for a pound being as they are. They've got plenty more for sale too, all sat along the top shelf of the curved bar; including a good number of Timothy Taylor Landlord vessels. And if you happen to fancy more than just the glassware; The Stork Hotel is currently up for lease, as the licensees Karen Murphy and her husband Larry bow out after a magnificent run of nearly 25 years this April. Click here to find out more. 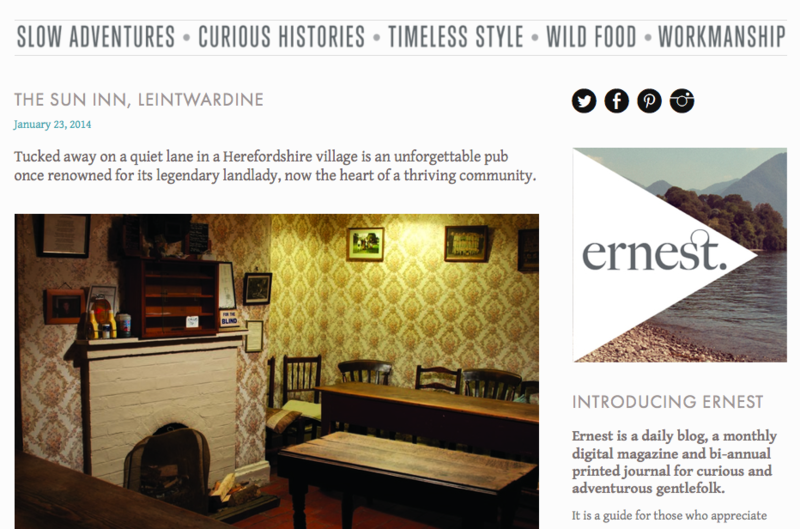 I was fortunate enough to meet Abi Whyte from the then soon-to-be-launched Ernest Journal at last year's Ludlow Food Festival; at the Doghouse pop-up pub. Thankfully we stayed in touch, and therefore very proud to announce that I've started a pub column for this fellow independent magazine. To get the ball rolling I've started a monthly pub blog: the first being The Sun Inn, Leintwardine. "He arrived early one evening to find landlady Flossie sat on her sofa watching Eastenders. Running the gauntlet for approval he was later instructed to help himself… walked through her living room and into the kitchen, where he found a pint glass, and turned the barrel tap. As he couldn’t quite fathom how to turn it off he quickly switched his full pint with an empty glass, and poured a second. By the time he’d figured what he’d been doing wrong he’d served himself no less than six pints. Putting his money onto the draining board, as you did, he proceeded to carry his round on a rickety old tin tray sheepishly past the landlady and into the right-hand room. " It’s amazing what you can do with some scrapped pine shelving, some mahogany tabletop inserts, a box of screws, the help of a younger cabinet-making brother and 10 hours to spare. Welcome, may I say, to the start of the Doghouse pop-up pub; the weekend prior to the launch of Doghouse back in May 2012. We've since carted our mini pub around the food and drink festivals of Ludlow, Abergavenny, Hay-on-Wye, and Stourbridge. We're always on the look out for new places to attend, so do please let us know of your favourite shows and festivals... and we'll see if we can book a pitch. A little while back Doghouse decided to investigate crowd-funding – ultimately to help increase exposure, distribution, and readership of the pub title. It was (quite possibly) one of the most difficult things I've done in a long while... next to rattling off a Doghouse presentation to a packed independent-magazine crowd at Printout, in Shorditch – this time sat on my lonesome in front of a video camera for (quite literally) a whole week, saying the same thing over and over again. And I only needed one minute of usable footage: easier said than done. The end result, embedded within the composed Kickstarter pledge site, can still be visited and observed, by clicking here, where you'll quickly learn that 17 backers pledged £515 out of the £8000 target. In a nutshell this means funding was unsuccessful. However, if nothing else, the Kickstarter process allowed me to overcome the fear of speaking to camera – just about – though the errors are slightly more amusing than the final edit. See below.... though please be warned: it is really best avoided if you shy from the repeated phrase '****ing hell'. I've had very little praise in the past for social networking, on a personal level at the very least – deeming it rather pointless, until – that is – this Friday just gone. Sat in my local as it happens my girlfriend so mentioned that she'd noticed a Facebook post, linked on a work colleagues page, announcing a recently-retired four-bank beer engine open for offers from the publican of a nearby pub. The posted plea for re-homing transpired to beckon from The Crown, Hopton Wafers (between Clee Hill and Cleobury Mortimer) and a mere stone's throw from where I call home. Unsure as to the make, the condition, or whether or not it was still there, the two of us headed out in the van nonetheless for a Saturday lunchtime pint the very next day... and along with my order of Ludlow Gold enquired after the handpulls needing a home. The barmaid looked somewhat puzzled; the first she'd heard of it, but happily whizzed off to the kitchen to locate the landlord, Terry. Braving the elements I was no sooner heading outdoors to the rear of the pub, with Terry, where there – leant up against the far wall – was a full-length beer engine: a cabinet of handpulls sodden to the core. The plinth was so saturated that its fibres shredded away with the slightest touch; the handpulls sunken into the swollen timber; the distortion of the plinth's cut-aways eliminating any play in the brass limbs. By the time we'd carried it to the van it had literally tumbled into five pieces: two painted MDF side panels, a front support of the same make and colour, a back-frame of England Worthside cylinders, and a top plinth of handpulls – the latter two tied together by only the four connecting steel rods. Knowing how much rain has been kicking around of late I'm not entirely sure how long this cabinet of beer engines has been left outside... it could have been just weeks; more likely months... whereas it could have easily been years. Nevertheless it was clearly salvageable; needing little more than some replacement wood, a bit of Brasso, and a flush of line cleaner. As it had collapsed under its own weight, bar its connecting rods, I immediately got stuck into loosening all the nuts, bolts and screws back home – carefully documenting the breakdown into a sturdy cardboard box. Decorated with simple black porcelain sleeves, and a run of swan necks, the workings transpired to be that of Birmingham's Harry Mason Limited – yet in place of the usual manufacture date happened to be the obvious stamp of Marston's... pressed from tip to toe into each of the main brass arcs of the pulling mechanism. In the very short space of time it's been in my company I've already grown rather fond of maintaining the Martson's tradition of only allowing their own blood to flow through this machine (if they'll be willing to supply me a steady supply of Banks's Bitter and Mild for the 2014 food and drink festival season that is) and add it to the existing four-bank beer engine currently dishing up ale on the Doghouse pop-up pub stand; which has so far proudly served Three Tuns: Cleric's Cure; Woods: Shropshire Lass; Kingstone Brewery: Challenger, Publisher Ales: Legend and Bromfield: and Ludlow Brewing Co's: Gold, Boiling Well, and Stairway. Last night was the reopening of Ludlow's Charlton Arms – following a lick of paint, removal of carpets and general tidy around. Fearing its heart and soul would be carried outside and left to soak in a skip I made some enquiries, the day prior, as to whether or not such a thing would be taking place – and if so; could I give any castaways a new home... thankfully I was kindly invited by the new landlord Cedric to come and peruse a corner of his car park and rummage through black bags, broken glass and old damp menus. First and foremost I was most pleased to discover most of the rubbish was just that, with little in the way of pub furniture and trinkets. That said I managed to bag a massive roll of pub carpet, a cracking little chair, a till box, plastic tray, heated soup caldron, a chalk board, empty picture frame, a clock, and a couple of glasses; all for Doghouse's pop-pub pub. So thank you Cedric; they'll all be put to great use. Sadly I hadn't the back or strength to tackle the upright piano, which was up for grabs, and even more sad to later hear that I'd been pipped to post with the stuffed and mounted goat's head – which I hope has found a lovely new home. Handshakes all around I then proceed home to unload the van of its pub bounty and head back up into town for a pint... only to find a small dog loitering outside. Free of a lead or collar, and too friendly for words, I scooped him up and contained him within the garden until a worried owner came scurrying down the road. No owner showed up. So I hunted out a spare lead and collar and paced the fox-like fellow up and down the road in hope that someone would spy him. They didn't. I then took him on a pub crawl; first taking in The Unicorn, where landlady Sharon, many locals and four or five dogs fell for the charming chap. He had biscuits galore, rolled around the floor, enjoyed the roaring open fire, and generally had lots of fussed made of him. But nobody recognised him; even the vet hadn't a clue. We then ventured into town; which abbreviated meant showing our faces in the Rose & Crown (no joy) and The Church Inn (still no joy). By this time I was tired of walking, so decided to rest a while longer here... where he was cuddled by one lady for the entirety of my Wye Valley Bitter, was fed more biscuits by more locals – even photographed by the local auctioneer. On the way out he got into a fight with another dog. All in all we'd been out and about walking and drinking for close on three hours, and he was clearly loving it; a no finer adventure for a dark cold Sunday evening. Thankfully he was very well-behaved; sitting and staying when told; and in extremely good condition, so he was grand company: But this was no stray, this was obviously being missed... but by whom? Walking back home my girlfriend and I quickly spotted someone walking across the road towards the cricket ground, clearly looking for something. The long and short of it – he was indeed the owner of (which transpired to be a 1-year old Milo). The most ridiculous part is that he lives two doors down. Milo had walked the grand distance of, give or take, 25 yards, before being scooped up me, lassooed with a lead, and carted into every decent pub for a pint and a parade. I honestly think the owner thought I was joking about the adventure we'd had (though I did leave out the bit about brawling outside the pub).